The Port Phillip & Westernport CMA is pleased to present the Port Phillip & Westernport CMA Annual Report 2017-18. The report was presented to the Hon. Lisa Neville, Minister for Water on Friday 31 August 2018, in accordance with Section 19B of the Catchment and Land Protection Act 1994, and tabled in Parliament on Thursday 20 September 2018. 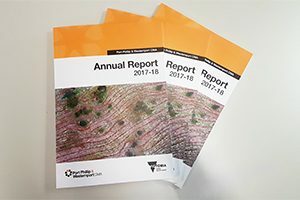 The Port Phillip & Westernport CMA Annual Report 2017-18 outlines our performance for the financial year against the strategic targets outlined in our Corporate Plan and is an opportunity for us inform our key stakeholders about our progress, as well as highlight our achievements and challenges.